The Charlotte Hornets are officially back!...well sorta. The Charlotte Bobcats will be back as the Charlotte Hornets in the 2014 season, but franchise owner Michael Jordan, just reintroduced the team's new branding and logo. 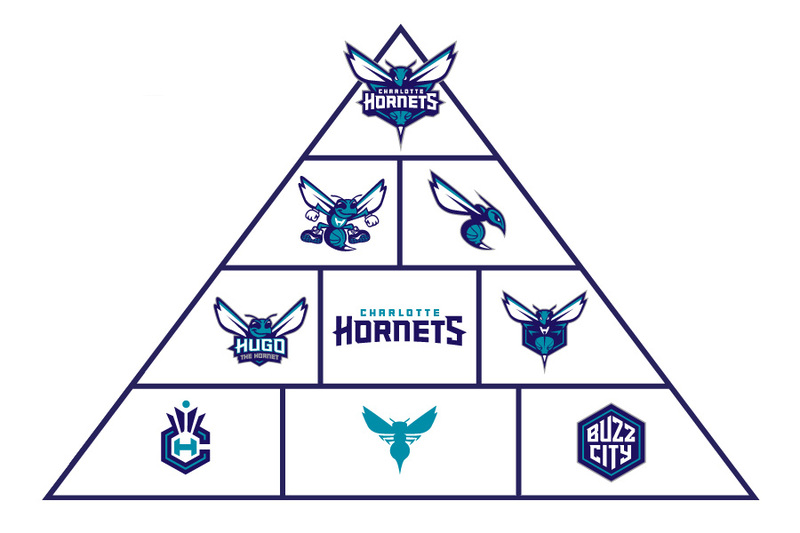 The new logo uses the iconic purple and teal color palette that was sported by previous Charlotte Hornet stars like Alonzo Mourning, Larry Johnson (Grandmama) and Mugsy Bogues. Included in the announcement, was this odd pyramid display of logos. Not sure if 9 variations of the logo is necessary. Usually a team has a primary lock up, 1 or 2 secondary combinations and then some mark that goes on the back on the jersey above the player's name. The bottom row looks like early concepts that we're edited out of the final presentation. Personally, I would have liked to have seen the Primary logo something more like the original refreshed logo, but I think most people will agree that this is a step in the right direction (designers & basketball fans). It's fair to see that "Hugo the Hornet" is back in some form. Lets hope for the city and the franchise that this is the start of something new.